The bad news parade for Boeing’s 787 Dreamliner just keeps marching on, as two Japanese airliners have grounded their fleets after an All Nippon Airways flight had to make an emergency landing today. This is just the latest in a string of incidents that have been plaguing the Dreamliner in recent weeks, prompting an investigation by the Federal Aviation Administration. Japan Airlines is grounding its seven aircraft while usually ANA has 17 Dreamliners in the air, reports CNN, but it isn’t clear how long those flights will stay put. An ANA flight carrying 129 passengers had to make an emergency landing in Japan, said the airline’s vice president, after a battery alarm signal went off. Witnesses say there was a burning smell in the cabin, and one alarm alerted crew to smoke in a forward electrical compartment. 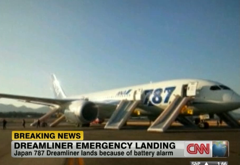 That same battery was involved in a fire aboard a Japan Airlines Boeing 787 Dreamliner that had been parked at Logan International Airport in Boston. The FAA’s investigation here in the U.S. is focused on reports of various leaks, engine cracks and a damaged cockpit window, all problems that have been hounding the Boeing 787 Dreamliner in recent weeks. It makes for a slow start for the new planes which have been touted as nothing short of wonderful. There are currently 50 Dreamliners in the possession of airlines, with a whole slew of orders for more waiting to be fulfilled. After the ANA flight had to make its unscheduled landing, the FAA chimed in that it’s on the watch and is checking out the report. “The incident will be included in the comprehensive review the FAA began last week of the 787 critical systems, including design, manufacture and assembly,” the FAA said in a statement late Tuesday.